We’ve said it before, and we’ll say it again -- adulthood doesn't have to keep you from going back to school, and neither does military service. Today, I want to introduce you to one individual who’s successfully balancing the demands of military service and a degree program, SFC Jennifer Sue Mock. She’s this year’s National Guard Scholarship recipient and one of many active duty service members and veterans among our ranks of students and alumni. Peirce’s National Guard Scholarship is a competitive, renewable, full tuition scholarship available to active members in good standing of the National Guard or a spouse of an active Guard Member from one of the following states: Pennsylvania, New Jersey, New York, Delaware, Maryland or Virginia. Jennifer is part of a long history of Peirce students who served in the military, and a well-deserving recipient of this scholarship. After graduating from Mifflinburg Area High School, Jennifer enlisted at the age of 18 in the Pennsylvania National Guard as an Information Systems Operator-Analyst with the Division Support Command. In 2001, she earned her associate's degree in electronics engineering technology from ITT Technical Institute, and shortly thereafter deployed to Bosnia on a Peace Keeping Mission with the 28th Infantry Division in 2002. 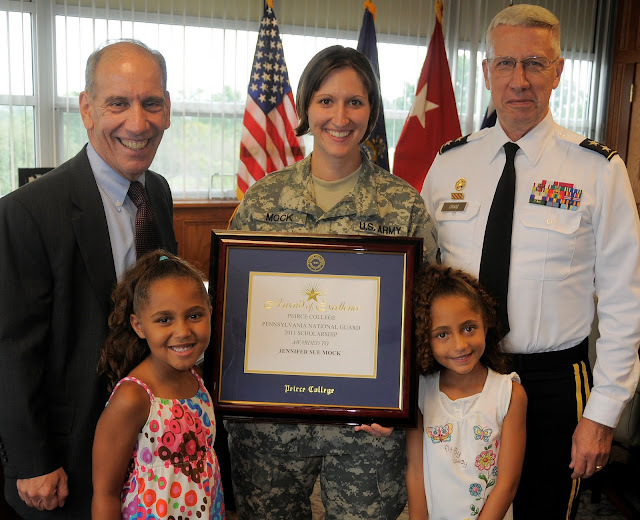 In 2004, she joined the Recruiting and Retention Battalion, where she currently serves as the Senior Automation NCO. Jennifer looked to her future and thought about the path she wanted her career to take, knowing that today’s IT sector demands a bachelor's degree to be competitive. With her sights set on becoming a warrant officer, Jennifer made the decision to pursue her bachelor’s degree in information technology at Peirce College. Jennifer will begin her coursework with a concentration in desktop applications in fall 2011, all the while balancing her busy schedule of work, family, and other responsibilities. While the professional reasons were plenty, the personal reasons for earning her bachelor’s degree were just as strong. Part of Jennifer’s motivation was to better provide for her daughters and to teach them the importance of education. She believes that the most effective way to teach her girls to be successful is to be a personal example to them and show them that determination and hard work makes anything possible. Jennifer, you are a wonderful example to us all! We’re honored to call you a Peirce student. If you or any National Guard members you know are interested in applying for the National Guard Scholarship or looking for guidance about returning to school, visit our website or stop by our Admissions Office. Peirce is a military-friendly school and our team is well-equipped to serve those who serve our country. Denise Kerr, Enrollment Representative specializing in military recruitment, comes straight from the Department of Veterans Affairs, and is a great resource for active duty or retired military members. She recently offered up some great advice as to the top five things service members should look for in a college -- take a look and don’t hesitate to come to us with questions!